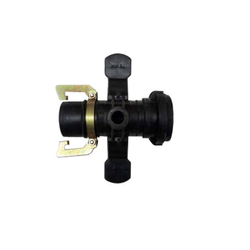 We are a leading Manufacturer of hdpe sprinkler attachment from Patna, India. We are reckoned as a prominent firm offering supreme quality HDPE Sprinkler Attachment. To meet the varying demands of the agricultural sector we are engaged in presenting innovative designs of sprinkler attachments that feature assurance of soil conservation and water economy. Designed and developed for our well-integrated work setup, the offered attachment is suitable for all kinds of irrigation and sprinkler systems. Further, it is made from highly durable HDPE injection molded material and can be ordered from us in varied sizes at a nominal price.